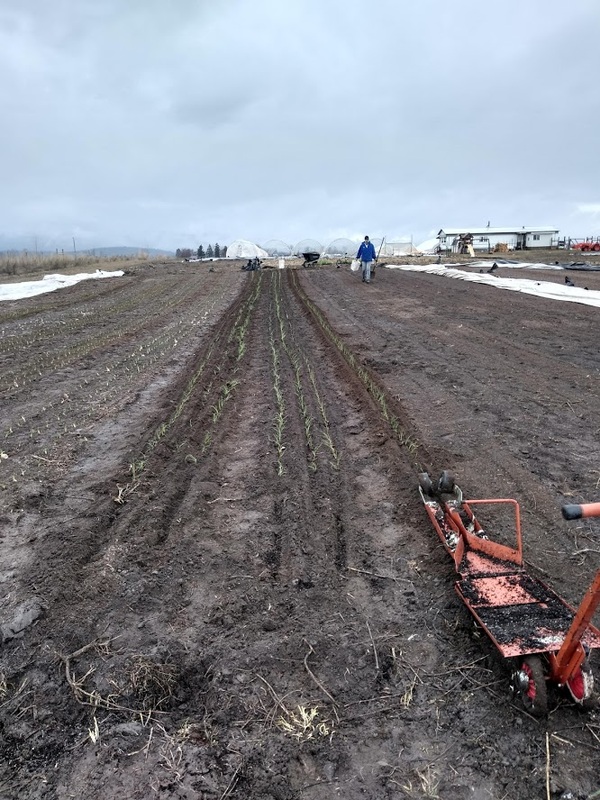 Did you know ONIONS are the first thing to get seeded on our farm each year? Started from seed in late February these little guys stay in our plant nursery for 8 weeks before heading to the field. They are always the first field planting of the year (we have planted them while it's snowing before!). They get weeded every two weeks, harvested around mid-August, and 'cured' in a tunnel. Quite the process for this humble weekly staple. But well worth it! Last year we grew over 1000 pounds of shallots, red onions, and sweet onions from a tiny handful of seeds. Exciting to see them in the ground for the season! We are grateful to a community that chooses local organic and we are thankful to watch the miracle of spring unfold each season. Did you know you can put tomatoes in the freezer and cook them later? I’ve pretty much stopped canning tomatoes. The season for canning them overlaps directly with our biggest harvest season of the year, and it’s right when we are hustling to get all the fall work done before snow flies. 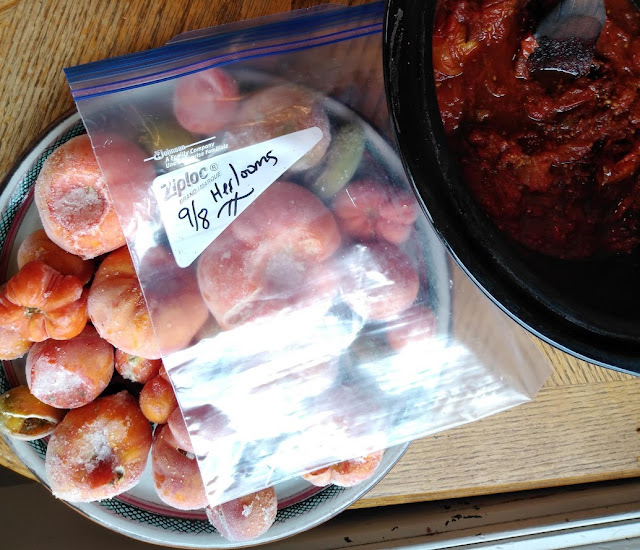 So I put fresh tomatoes in a gallon freezer bag. Yup! That’s it! Then I pull them out of the freezer and slow cook them in a crockpot on low 12-48 hours. I zap them in the blender (an immersion blender or food processor would work just as well) and keep these cooked tomatoes in the fridge for adding to soups, stews, and sauce during the week. The night before cooking, set lentils to soak in water. Before cooking, rinse off soaking water. Have you heard about the health benefits of soaking grains and legumes? I love it when you can get more health benefits from food without having to spend more money. Here’s the scoop. Grains and legumes contain an anti-nutrient called phytic acid that makes them hard to digest. Soaking them vastly reduces the phytic acid content. Never hear of that and want more info? This article shows both sides of the ‘debate’. 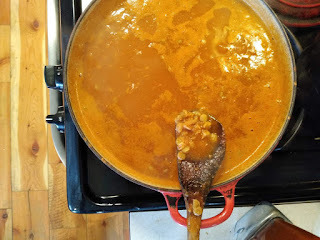 For me, I choose to soak grains, nuts, and legumes because oats, quinoa, rice, lentils, and almonds are staples in my family’s diet and it doesn’t add much prep time to soak before cooking. 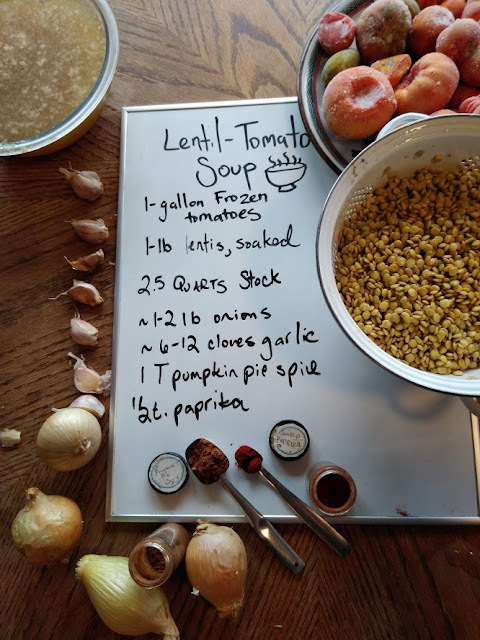 Also, after using this as a daily practice for the last ten years I really prefer the taste of pre-soaked foods and can tell a difference in ease of digestion (spoiler: it takes a lot of food to fuel farm work!). Part of living in a small mountain town is only being able to find certain spices and condiments on Amazon Prime (I am adamant that I’m not a food snob...but also Red Boat Fish Sauce (insert link) brings me great joy in the XL bottle…). So...I’m out of Harissa and they don't sell it in bulk at our local stores (one of my 'Small Changes' for the year is to only buy bulk herbs and spices) but I do have Pumpkin Pie Spice I bought in the bulk section at Mountain Valley Foods and I use pumpkin pie spice whenever I’m out of Harissa... It’s been so cold out this week and I’m looking to use up a lot of the frozen tomatoes so I have been loving this recipe for Tomato Lentil Soup. 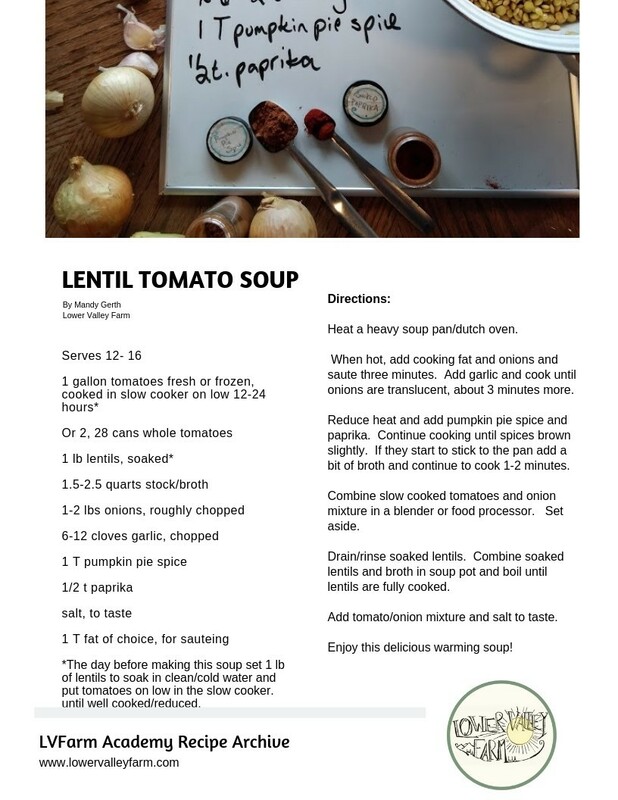 Hope you all are enjoying the spring weather and warming up with some good soup! P.S. Would you like to get our recipes in a .pdf instead of a picture on our website? Sign up for Farm To Table weekly by filling out the 'Pop-up' form on this page and Farm To Table Weekly will land in your inbox each monday with attachments as easy to print .pdf files!